Take a look at the front suspension. This bike has dual front suspension to take the impact of those nasty potholes! This makes for a better ride and enables a heavier person(s) to be able to have a comfortable ride. For this bike we offer a rear trunk with key lock. It is shown in the pictures. This can be ordered at our webstore when you order your bike with no extra charge for shipping. For this bike we offer an optional front fork lock. No one can just hop on your bike and take off. This theft deterrent is nicely stored in an upright position during riding. When you park, you pull it out and stick it through the front forks to keep the bike from being pushed away, so if someone does cut your chain bike lock, they cannot push the bike away. With normal care and recommended maintenance, this electric bicycle is warranted to be free of defects in materials and workmanship for the following period of time: 3 months – electronic controller, charger, and throttle; 6 months – hub motor and battery; 12 months - frame and structure. 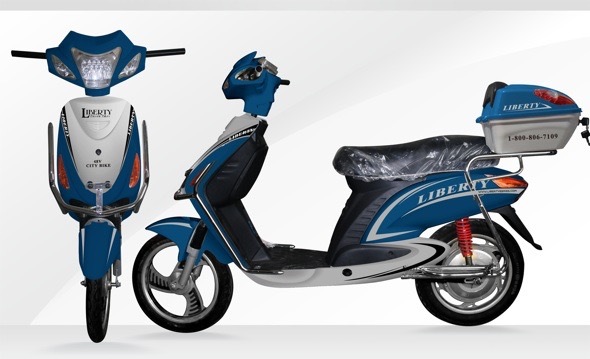 We will repair or replace, at our option, any product or part that is defective in material or workmanship, without charge if the product is presented to us at our authorized Liberty Electric Bike Service Center at 1-800-806-7109 with dated proof of purchase inside of warranty period. This limited warranty does not cover the normal wear of items such as tires, brakes, chains, and other items. All implied warranties are limited to the stated time period. Liberty Seamless Enterprises, Inc., Liberty Electric Bike Company, and any of its subsidiaries will not be liable for any incidental or consequential damages. This limited warranty gives you specific legal rights, and you may have other rights from state to state.